This is the Dining Room where all the adults in the family and any visitors would enjoy their meals together. Michael Byrne wanted the big house but he had to save some money in its construction – there is no ceiling rose, cornice or inside shutters. The original fireplaces in the house were a dressed concrete known as COAD stone – the marble one in this room is a later replacement, but you will note the beautiful Georgian design. The sideboard is an Edwardian piece which stood in local architect, A. R. Payten’s house, Kialba, and is now owned by the Campbelltown and Airds Historical Society Inc. 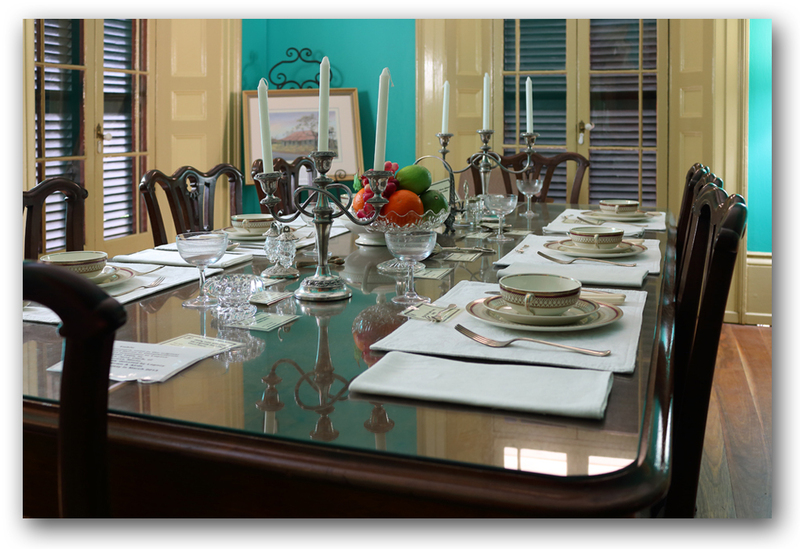 The centrepiece on the table is a Victorian style piece which was donated to the Society. The image at the top of this page is in fact a photo of our latest dinner setting. Please enjoy looking at the domestic items from our collection here when you visit. After dinner the ladies left the gentlemen and went into the Drawing Room across the hallway.